This book, The Early and the Latter Rain of the Holy Spirit, describes two distinct functions of the Holy Spirit, which God will use to prepare His end-time church for her final work. As in nature, so in grace. As the early rain falls, causing the seed to germinate, spring forth and grow, so the outpouring of the Holy Spirit on the day of Pentecost was the beginning of the growth and development of the Gospel seed. 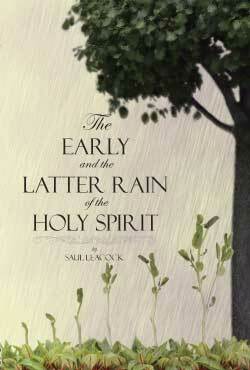 Near the close of earth's history, there is to be a special outpouring of the refreshing Latter Rain of the Holy Spirit. This will fill out the grain, ripen earth's harvest for the final events and prepare it for the sickle. Two classes will then be fully developed, one in righteousness, and the majority other in wickedness. Now is the time for God's people to show themselves true to principle. To stand in defense of truth and righteousness when the majority forsake us, to fight the battles of the Lord when champions are few this will be our test. At this time we must gather warmth from the coldness of others, courage from their cowardice, and loyalty from their treason. 5 T 136.